I_EDITOR is a programming game. The goal is to write simple scripts to reproduce a drawing on screen. The commands used in the scripts move a pointer (“turtle”). The pointer has a pen, which can be up or down. When the pen is down, each move lays a print. There are additional instructions to make calculus, evaluate conditions and call previous declared sequences. The syntax and semantic are organized in language called I_CORE. 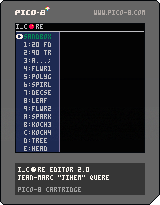 I_EDITOR 2.0 and its manuals are available as a PICO-8 cartridge (download the picture) and PDF files : english , french. You can play the game online.